This article is about the Neil Young song. For the song of the same title by Love, see Forever Changes. About that time when I wrote ("Heart of Gold"), and I was touring, I had also—just, you know, being a rich hippie for the first time—I had purchased a ranch, and I still live there today. And there was a couple living on it that were the caretakers, an old gentleman named Louis Avila and his wife Clara. And there was this old blue Jeep there, and Louis took me for a ride in this blue Jeep. He gets me up there on the top side of the place, and there's this lake up there that fed all the pastures, and he says, "Well, tell me, how does a young man like yourself have enough money to buy a place like this?" And I said, "Well, just lucky, Louis, just real lucky." And he said, "Well, that's the darnedest thing I ever heard." And I wrote this song for him. He tells a similar story when introducing the song at a February 23, 1971 performance broadcast by the BBC (in which he says that he purchased the ranch from "two lawyers"). In 1988, the song is heard in the film Running on Empty. In 1998, N'Dea Davenport recorded the song for her 1998 debut album, N'Dea Davenport. In 2000, the song is heard in the film Wonder Boys. In 2000, jazz pianist Brad Mehldau covered the song for the soundtrack of the film Space Cowboys. In 2001, the song is heard in the documentary film Dogtown and Z-Boys. In 2004, the song was covered by Canadian folk trio The Wailin' Jennys for their debut full-length album 40 Days, and by Wilson Phillips for their covers album, California' 2013'. In 2005, Lizz Wright covered it on her live album Dreaming Wide Awake, recorded at Allaire, Shokan, New York the year before. It also appears in the film Lords of Dogtown. In 2008, during the memorial service for Heath Ledger, the song was chosen to be played with a slideshow of pictures from Ledger's life. Liam Finn (Neil Finn's son) & EJ Barnes (Jimmy Barnes's daughter) covered the song on the TV show RocKwiz. In 2010, the live version of the song from Live at Massey Hall 1971 was used briefly in the film Due Date. Donna Loren covered the song on her album Love It Away, and James McCartney covered the song on his EP Available Light. This version was featured in the second episode of season five of the TV series Californication. In 2011, Dallas Green, of City and Colour and Alexisonfire, covered the song at The 2011 Juno Awards, and post-grunge band Puddle of Mudd covered it on their covers album Re:(disc)overed. 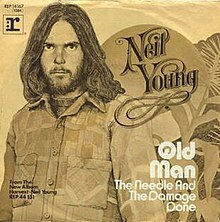 That same year Redlight King sampled "Old Man" on the album Something for the Pain. It was the first time Young had sanctioned a sample of this song. In 2014, the song appears in the last scene of the film The Expendables 3. In 2015, Young appeared on The Tonight Show Starring Jimmy Fallon and performed the song with Fallon as his Neil Young character. ^ "Harvest". Discogs. Retrieved 2015-07-21. ^ Jimmy McDonough. Shakey: Neil Young's Biography. New York: Anchor, 2003, p. 364. ^ Leigh Creighton and wires (February 4, 2008). Heath Ledger's star-studded Hollywood memorial. Daily Telegraph. Accessed February 3, 2008. ^ "Official Redlight King website". Redlight King. Retrieved 2011-06-19. ^ "Jimmy Fallon Sings With Neil Young As Another Neil Young". Huffington Post. February 4, 2015. This page was last edited on 10 December 2018, at 21:35 (UTC).